We’ve been talking a lot about pairings recently. But pairings can go further than food and drinks. You can have pairings of personalities and talents. And when those things work together, you’ve got something bigger than the sum of their parts. It’s almost not fair that in one of Downtown Albany’s buildings we’ve got the talents of Robert Mack and Dimitrios Menagias. Robert is in charge of the cocktail program at the speakeasy. Dimitrios is responsible for the food at the City Beer Hall. Both care deeply about what they do. If that dynamite combination wasn’t enough, now the place has just added Ian O’Leary to the roster. That’s just rubbing it in. 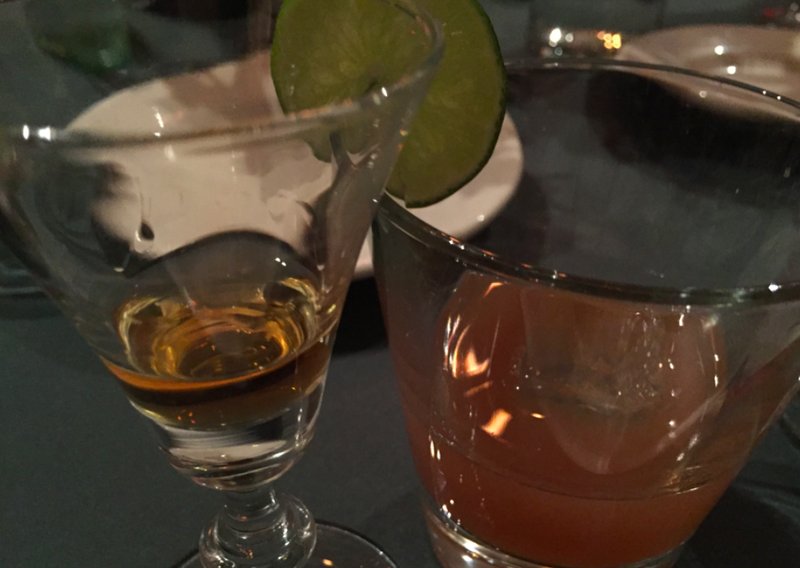 You can feel free to take all of this gushing with a grain of salt, as I’m coming off of an amazing five-course bourbon dinner (plus a bonus amuse bouche) which was hosted by Brown Forman. I’m indeed grateful for the invitation, but that doesn’t change my opinion of the meal. But I’ve been bullish on these two for years. 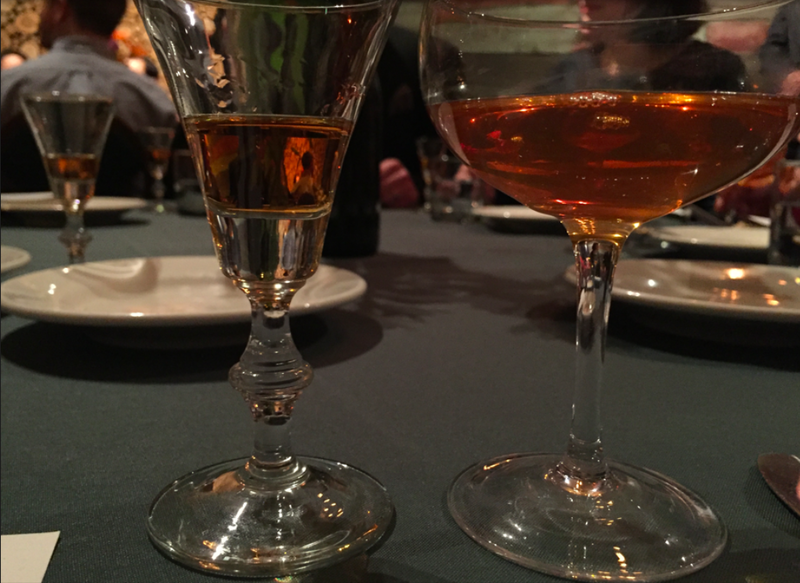 What I really want to focus on today are a couple of the actual food and beverage pairings from the dinner, and one of the whiskeys that really impressed me on its own. Of course the other thing that made last night a ton of fun was the company. Usually, I do these kinds of things on my own. But this was special and I got to hang out with former AOA pizza judges Albany Jane, Deanna Fox, and Jon in Albany. The four of us were at a table with some folks from a couple of BMT restaurants, and a local cocktail bitters producer. One of the things I learned at dinner was that Ama Cocina has what would seem to be a mighty impressive mezcal selection. To me, that’s an exciting thing indeed. And I’m left wondering why this is the first I’m hearing about it. But that’s a subject for another time. A dynamite feature of this tasting was the ability to try a base spirit on its own and then to taste it mixed into a cocktail. I have to say on its own, I was wowed by the spice and body of the Woodford White Corn Bourbon. That was some delicious whiskey. It’s not a white bourbon, but rather an aged golden bourbon made from white corn. The grain element is noticeable, and I loved the powerful peppery finish. Robert’s cocktail helped to tame the spirit and gave it some bitter complexity, but this was a whiskey that I could sip on its own all day. The second official cocktail was something called a Lion’s Tail which took Old Forester 1870 and gave it the acidity of lime, with the warm tones of allspice. On paper it doesn’t sound like it would work. But it does. Beautifully. So beautifully in fact, that I’m tempted to go out and pick up some allspice liqueur. However, as good as the drink was on its own, it was absolutely brilliant with a charcuterie plate of duck pastrami, foie gras mousse, venison, sweet corn mostarda, and pickled tomatoes. There was some grilled Bonfiglio bread on that plate too. But that mostarda that Dimitrios built just made the drink sing. The pomelo sorbet with aperol was a great intermezzo, but the candied pomelo peel really stole the show. When the fourth course came out, the aroma of braised boar shank was enchanting. This was a dish that just reached up from the plate and grabbed you. And the play between smoked corn and buttery spaetzle was fantastic. The Bourbon Manhattan made from Old Forester 1897 was intensely aromatic and complex. Robert’s brandied cherries are also very special, and fill me with pleasure every time I get one on a cocktail skewer. But the closer may have been the best of all. On its own the 130.8 proof Single Barrel Jack Daniel’s Whiskey was just too much for me. And I’ve been known to enjoy an intense barrel proof bourbon in the past. But Robert took this spirit and tempered it with Cointreau Noir and one drop of Angry God bitters, which are made locally with ghost peppers. It’s amazing how the heat from the chilis helps to neutralize the heat from the high alcohol. Equally amazing was how well the drink paired with a dessert of dried white figs, stuffed with Harbison cheese, topped with toasted pecans, and showered with dark chocolate shavings. This dish was so heady with the perfume of dark chocolate and funky cheese, that I had to push it away from me a bit to better evaluate the whiskey. It was incredible. I suspect Albany Jane will have a bunch of pics up on her blog. Fox was taking pictures as well. Coming off of this meal, I’m even more excited about City Beer Hall’s wild game dinner at the end of the month. I bought my ticket early, which was a good thing because it sold out last week. But you should keep your eyes open for the next special event at the CBH. Robert may not be involved in the beer dinners, but he’s easy to spot behind the bar at the speakeasy. And I’m sure it wouldn’t be hard to convince him to whip up something special that suits your tastes. Although I’d recommend asking for some kind of version of the Lion’s Tail. Because I’m still haunted by the beautiful flavors of that drink and how well it went with charcuterie, which as luck would have it, is available for nibbling at the speakeasy. Thanks again to the whole team at City Beer Hall and our host Brown Forman for a wonderful and inspiring night.